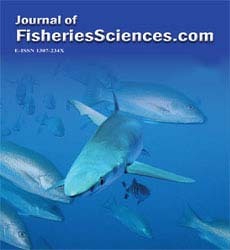 Comparative characteristics, common and distinctive features of qualitative and quantitative composition of myofibril proteins of skeletal muscles of some deep-sea fish species (Podonema longipes, Coryphaenoides cinereus, Coryphaenoides pectoralis) have been determined. Myofibrillar proteins were extracted from the skeletal muscle of three species deep-sea fish and their relative molecular mass was estimated by SDS/polyacrylamide gel electrophoresis. Subunit and quantitative compositions of deep-sea fish proteins were determined. The molecular weight of predominant contractile proteins, myosin (with heavy chains and two light chains), actin, troponin and tropomyosin was about 492, 47, 38 and 35 kDa, respectively for all fish species. The myosin/actin ratios were determined to be 2.85, 2.76 and 2.56 respectively for C. cinereus, P. longipes, and C. pectoralis. The Ca2+-ATPase activity of C. cinereus and P. longipes actomyosins was significantly higher at low ionic strengths (0.317 and 0.324 μM Pi mg-1 min-1 accordingly) than at high ionic strengths (0.257 and 0.221 μM Pi mg-1 min-1 accordingly). At the same time the Mg2+- ATPase activity value remained almost constant at both high and low ionic strengths (0.169–0.178 μM Pi mg-1 min-1). The Ca2+-ATPase activity of C. cinereus, P. longipes and C. pectoralis myosins was 0.534, 0.641 and 0.376 μM Pi mg-1 min-1 respectively. Deep-sea fish have not generally been used for food, but its abundance suggests it could be an important source of highquality protein. Deep-sea fish have much different significance for industrial fishing. Three species of deep-sea fish Coryphaenoides pectoralis, Coryphaenoides cinereus and Podonema longipes are the most accessible for effective fishing in the Far-Eastern Seas of Russia. These three species were chosen for investigations in the present paper. For processing of fish meat, the knowledge of the properties of fish muscle proteins is necessary. The main aim of the present paper was to determine the composition of basic myofibrillar proteins and its ratio in skeletal muscle tissue. Investigations of the biochemistry of muscle tissue of deepsea fish have only incidental character and systematic study of this has not been carried out. In most cases the studies of researchers have been limited to mesopelagic species. So, there are information about thermostability of deep-sea fishes skeletal muscle actomyosin (Arai, K et al., 1973), myofibrillar proteins as a whole (Uchiyama, H et al., 1978) and water soluble proteins (Taguchi, T et al., 1981). But for all that, the information about the basic and regulatory protein’s composition, of the skeletal muscles of deep-sea fish species, is perfectly absent. Biochemical properties of these proteins practically have not been studied. At the same time, great amounts of information about these species habits (Dayton, P.K and Hessler, R.R., 1972) and feeding patterns (Drazen, J.C et al., 2001), along with their biological and biochemical mechanisms of adaptation to low temperatures and high pressures (Wakai, N et al., 2014; Morita, T., 2010) have been accumulated in scientific literature at the present time. The usual depth of the adults of these species range from several hundred meters to upwards of 2,500 m. The tissue composition of these deep-sea fish also suggests a midwater lifestyle. The majority of deep-sea fish species are characterized by high moisture contents in the muscle tissue (Somero, G.N., 1992; Siebenaller, J.F et al., 1982). So, the white muscle tissue of Coryphaenoides pectoralis is composed of approximately 92% water. This high value of muscle water content is likely an adaptation to increase buoyancy without the metabolic costs of buoyant lipids or a gas bladder (Drazen, J.C et al., 2001). The compositions of the skeletal muscle myofibrillar proteins of these species are unknown. Therefore, determining the composition of these muscle proteins seems very important for understanding the contribution of muscle myofibrillar proteins to meat texture. White muscles (musculus lateralis magnus) of three species of deep-sea fish Coryphaenoides pectoralis, Coryphaenoides cinereus and Podonema longipes were used for research. All fishes were immediately filleted and dorsal white muscles were coarsely minced, mixed with an equal volume of glycerol, and the mixture was frozen at –40°C and was kept frozen at –24ºC until use, not longer than one month. Preparation of myofibrils isolation was carried out by method of Kato (Kato, N., Uchiyama, H., Tsukamoto, S., Arai, K., 1977; Kato, S., Konno, K., 1993). Actomyosins of deep-sea fish skeletal muscles were isolated by the extraction at high ionic strength, pH 6.4. Actomyosins were purified twice by precipitating at ionic strength 0.1 and recovered as solution in 0.6 M KCl. For additional purification of actomyosins and removing the regulatory proteins the method of fractional precipitation with ammonium sulfate was used. So, pure actomyosins were isolated at ammonium sulfate concentration below 35% of degree of saturation. Myosins were isolated by the method of Bruggmann and Jenny (Bruggmann, S and Jenny, E., 1975) with some modifications. The solution of 0.3 M KCl, 10 mM Na4P2O7, 1 mM MgCl2 in 0.15 KH2PO4 (pH 6.4) was used as basic one for extraction and after dilution with 10 volumes of water for “batch” process on DEAESepharose 4ÃÂ (Pharmacia Biotech AB). So, myosins with highest possible ATPase activity were prepared. Tropomyosins were isolated by the method of Bailey (Bailey, K., 1948). The isolation procedure of protein was carried out in high ionic strength solutions (0.5-0.6 M) with using ammonium sulfate as a salting-out agent. Troponins were isolated by the method of Ebashi (Ebashi, S et al., 1968). Actin and actinine were isolated by the method of Ishikawa (Ishikawa, H., 1983). The qualitative composition of myofibrillar proteins was investigated by the means of disk-SDS-electrophoresis (PAGE mode) (Weber, K and Osborn, M., 1969). The correlation of molecular weight with relative mobility was obtained with the following standard proteins (ICN Biochemicals Inc.): catalase (molecular weight, kDa, 232), bovine serum albumin dimer (132), bovine serum albumin (66), ovalbumin (45), carbonic anhydrase (29), β-Lactoglobulin (18.4) and α-lactalbumin (14.5). Polyacrylamide gels with acrylamide concentration 3.5% of concentrating layer were used. Concentrating process was carried out at 15 mA and 210 V. Gels with constant concentration of acrylamide 10, 12.5 or 15% and gradient concentration of acrylamide 10-15% were used as separating ones. The separating process was carried out at 5 mA and 100 V. Disk gel was stained with 0.15% coomassie brilliant blue R-250 in 50% methanol-10% acetic acid at 25ºC for 5 min and was detained with 50% methanol-5% acetic acid at 25ºC overnight. Densitometry was carried out on the stained disk gel using a chromatoscanner UV-260 (LKB, Sweden) at wavelength of 640 and 700 nm. Ultraviolet fluorescence spectrums were recorded by RF-5000 (Shimadzu, Japan) spectrofluorimeter at extinction wavelength (λEx) 280 nm. Ratio of fluorescence intensities at 320 and 360 nm (A320/A360) was calculated for characterization of proteins state (Turoverov, K.K et al., 2002; Turoverov, K.K et al., 1999). Protein concentration was determined by the method of Lowry (Lowry, O.H., Rosebroughm N.J., 1951), UV-spectrums were recorded by UV-1800 Shimadzy spectrophotometer. The ATPase activity (EC 3.6.1.3) assay was carried out for 10 min at 25°C in the reaction mixture containing either 0.15 M or 0.6 M KCl, 0.1 mg / ml of protein, 2.5 mM ATP (Kato, N et al., 1977; Seki, N and Narita, N., 1980; Okagaki, T. et al., 2005). The pH value of the mixture was adjusted 7.5 for ionic strength 0.6 and 7.0 for ionic strength 0.15 by using 30 mM Tris-maleate buffer (Mori, Y et al., 1980). The reaction was stopped by adding trichloroacetic acid solution. Superprecipitation was induced at 20ºÃÂ¡ by adding 1 mM ATP to the reaction mixture containing 60 mM KCl, 2 mM MgCl2, 0.1 mM CaCl2, 20 mM Tris-maleate, (pH 6.8), 0.1 mg/ ml of actomyosin. Absorbance at 540 nm was recorded by UV- 1800 Shimadzy spectrophotometer. Extent of superprecipitation was expressed as ΔO.D=Amax – A0, where Amax is the maximum absorbance upon addition of ATP and A0 is the absorbance in absence of ATP. The rate of super precipitation was expressed as t1/2 – time corresponding half-cycle of process when (A-A0)=(Amax – A0)/2. The results were presented as arithmetic means and their standard deviations. The applied methods were evaluated statistically with the use of STATISTICA 8.0 software. Disk-gel electrophoretic patterns of myofibrillar proteins of three species of deep-sea fish obviously were not speciesspecific (Figure 1). It is significant that the myosin/actin ratio for actomyosins of deep-sea fish skeletal muscles is lower in comparison with traditional vertebrates. The ratios were determined to be 2.85, 2.76 and 2.56 respectively for C. cinereus, P. longipes, and C. pectoralis. How actomyosins of deep-sea fishes skeletal muscle hydrolyzed ATP and ATPase activity depended on their Ca2+ and Mg2+ concentration. The Ca2+-ATPase activity of C. cinereus and P. longipes actomyosins was significantly higher at low ionic strengths (0.317 and 0.324 μM Pi mg-1 min-1 accordingly) than at high ionic strengths (0.257 and 0.221 μM Pi mg-1 min-1 accordingly). At the same time the Mg2+- ATPase activity value remained almost constant at both high and low ionic strengths (0.169-0.178 μM Pi mg-1 min-1 There was not dependence on actomyosin of C. ÃÂectoralis ATPase activity both effectors and ionic strength. Actomyosins of all objects showed highest ATPase activity at 5 mM Ca2+. The lowest values of ATPase activity were shown when both effectors were used in equal concentration (2.5 mM). The results of cross effect studies on the added Ca2+ and Mg2+ ions showed that the effect of Mg2+ overcomes that of Ca2+ in the testing conditions. In the presence of ATP, actomyosins of the skeletal muscles dissociated in high ionic strength solutions. It was illustrated in the changes of certain attributes such as viscosity (Figure 2) and parameters of ultraviolet fluorescence (UVF). 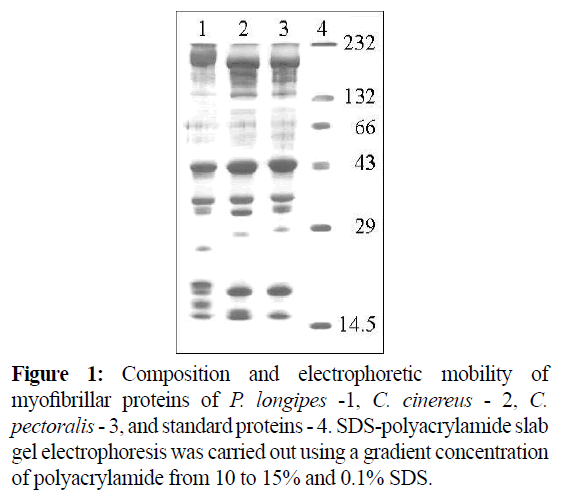 Figure 1: Composition and electrophoretic mobility of myofibrillar proteins of P. longipes -1, C. cinereus - 2, C. pectoralis - 3, and standard proteins - 4. SDS-polyacrylamide slab gel electrophoresis was carried out using a gradient concentration of polyacrylamide from 10 to 15% and 0.1% SDS. 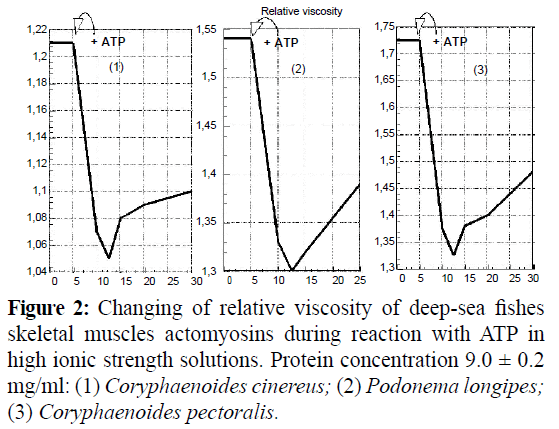 Figure 2: Changing of relative viscosity of deep-sea fishes skeletal muscles actomyosins during reaction with ATP in high ionic strength solutions. Protein concentration 9.0 ± 0.2 mg/ml: (1) Coryphaenoides cinereus; (2) Podonema longipes; (3) Coryphaenoides pectoralis. As shown (Figure 3), the intensity of actomyosin UVF decreased with the increasing ATP concentration. At that the halfwidth of UVF-signal increased (Table 1). 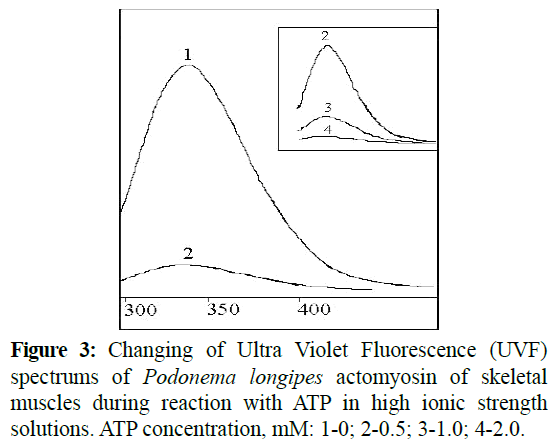 Figure 3: Changing of Ultra Violet Fluorescence (UVF) spectrums of Podonema longipes actomyosin of skeletal muscles during reaction with ATP in high ionic strength solutions. ATP concentration, mM: 1-0; 2-0.5; 3-1.0; 4-2.0. *Denaturation in 10 ÃÂ urea solution at 80°ÃÂ¡, 5 min. CATP -ATP concentration; λEm - emission wavelength; AMax - emission maximum; A320 -emission at 320 nm; A360 - emission at 360 nm; W1/2h – half- width of emission signal Protein concentration – 0.12 mg/ml. Table 1: Characteristics of Ultra Violet Fluorescence spectrum of Podonema longipes actomyosin at the different ATP concentrations. As shown in Table 1, increases in the half-width of UVFsignals occurred as a result of protein denaturation. However, the wavelength of emissions remained stable during reaction with ATP, whereas the shift to the long-wavelength field of spectrum occurred in cases denatured proteins. It is important to note that changes of the UVF-spectrums characteristics were irreversible ones during reaction with ATP, and were only restored after the reprecipitation of proteins. For cases where actomyosins dissociated at low ionic strengths (Maruyama, K and Gergely, J., 1962), they were accompanied by super precipitation during reactions with ATP (Figure 4). The superprecipitation values correlate with Mg2+-ATPase activity in low ionic strength solutions, while superprecipitation rates depend neither on ATPase activity values nor on super precipitation values (Table 2). 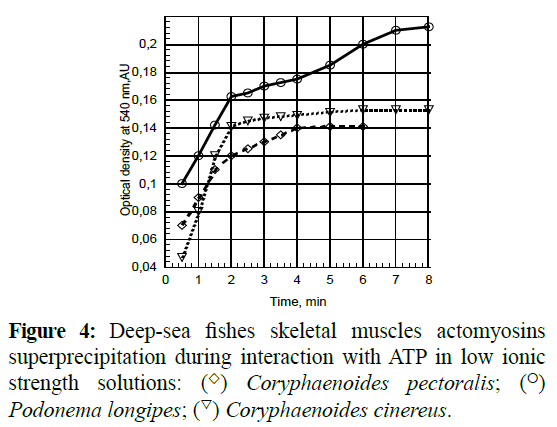 Figure 4: Deep-sea fishes skeletal muscles actomyosins superprecipitation during interaction with ATP in low ionic strength solutions: (◊) Coryphaenoides pectoralis; (o) Podonema longipes; (∇) Coryphaenoides cinereus. Table 2: Superprecipitation of actomyosins of skeletal muscle of deep-sea fishes. We have observed actomiosins aggregation under the influence of heat treatments. The aggregation rates increased with increasing temperatures, and denaturation changes became apparent at temperatures of more than 35°C. By means of UVF (Turoverov, K.K et al., 2002; Turoverov, K.K et al., 1999) we ascertained that the degree of denaturation (as a partition of denaturated protein) had a logarithmic dependence on heating time. At that, the denaturation rate constant had an exponential dependence on temperature at a range of 35-55ºC (Figure 5). 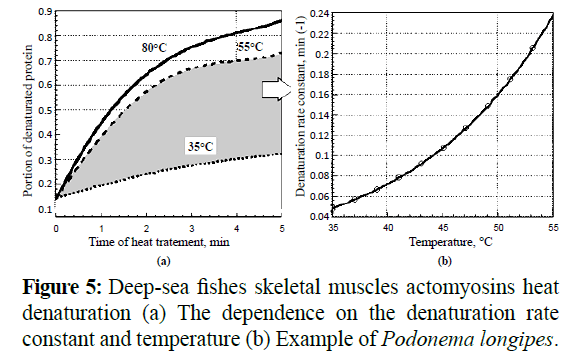 Figure 5: Deep-sea fishes skeletal muscles actomyosins heat denaturation (a) The dependence on the denaturation rate constant and temperature (b) Example of Podonema longipes. The main problem of myosin extraction was the quantitative and selective isolation of this protein from myofibrills. The 0.3 M KCl, 5 mM EDTA, 1 mM dithiothreitol solution, pH 6.4, was used for the selective myosin extraction (Figure 6, Track 1). 10 mM sodium pyrophosphate when added to this solution increased neither selectivity nor effectiveness in myosin extraction (Figure 6, Track 2). At the same time the addition of only 1 mM ATP and 2 mM MgCl2 to the extraction mixture allowed a remarkable increas in effectiveness and a slight increase in selectivity (Figure 6, Track 3). And vice versa, a pretreatment of the concentrate myofibrils with a low ionic strength solution, (Figure 6, Track 4) or in the aggregate with an extraction using Mg-ATP (Figure 6, Track 5), both allowed to maximum selectivity and poor effectiveness of the extraction of myosin. Extraction was carried out at a ratio of muscle tissue: extractive solvent, 1:5 for all variants. Figure 6: Selectivity and effectiveness of myosin extraction from myofibrils of deep-sea fish. Extraction was carried out at a ratio of muscle tissue: extractive solvent, 1:5 for all variants. An example for muscle tissues of Coryphaenoides cinereus is shown. Track 1- 0.3 ÃÂ KCl, 5 mÃÂ EDTA, 1 mÃÂ dithiothreitol. Track 2 - 0.3 ÃÂ KCl, 5 mÃÂ EDTA, 1 mÃÂ dithiothreitol, 10 mÃÂ Na4P207. Track 3 - 0.3 ÃÂ KCl, 5 mÃÂ EDTA, 1 mÃÂ dithiothreitol 1 mÃÂ ÃÂÃÂ¢P, 2 mÃÂ MgCl2; Track 4 - preliminary extraction by 20 mM TRIS-HCl, pH 7; extraction by the means of 1. Track 5 - preliminary extraction by 20 mM TRIS-HCl, pH 7; extraction by the means of 3. The most satisfactory results of myosin’s isolation were achieved by using the Bruggmann-Jenny method (Bruggmann, S., Jenny, E., 1975). The yields of myosin preparations were around 10-14 mg from every 100 g of muscle tissue. Myosin, prepared in this method, showed all the typical properties of myosin already shown in well-investigated cases: ATP hydrolysis activity, low ATP-sensitivity, negative superprecipitation reaction, and low viscosity compared to those of actomyosin. The characteristics of the myosins of deep-sea fish’s skeletal muscles are shown in Table 3. * –Ultraviolet spectrum; ** –Ultraviolet fluorescence spectrum. Table 3: Characteristics of myosins of deep-sea fish’s skeletal muscles. Subunit and quantitative compositions of deep-sea fishes myosins were determined by mean of total and partial dissociation (Table 4). The full separation of all light chains of myosins occurred in low-concentrated urea solutions. It is necessary to note that different concentrations of urea solutions were used to examine the myosins treatment. So, the necessary and sufficient urea concentration for the separation of C. cinereus myosin light chains was 2.0 M, for P. longipes - 2.8 M and for C. pectoralis - 3.2 M. These values were determined by means of UV-fluorescence (Figure 7). The point where the increase of half-width of UVFspectrum signals began, during titration of myosin or actomyosin solutions by urea, served as the criterion for the determination of urea concentration. At that, the values of the A320/A360 ratio remained more than 1. It signifies the absence of deep delocalized changes in the myosin structure during such treatments. Table 4: Myosin subunits dissociation. *) – 2.0; 2.8 and 3.2 M for myosin of Coryphaenoides cinereus, Podonema longipes and Coryphaenoides pectoralis accordingly. 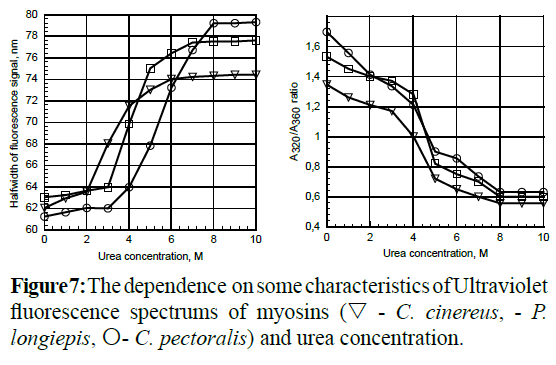 Figure 7: The dependence on some characteristics of Ultraviolet fluorescence spectrums of myosins (∇- C. cinereus, - P. longiepis, O- C. pectoralis) and urea concentration. The most effective results of total myosin light chains separation were realized during brief (3-4 min) intensive heat treatments (53°C) of protein solution. Most of the proteins (about 60%) were aggregated in these conditions (Figure 8, Track 2). Actomyosin may be used as a substitute in this experiment, instead of myosin. 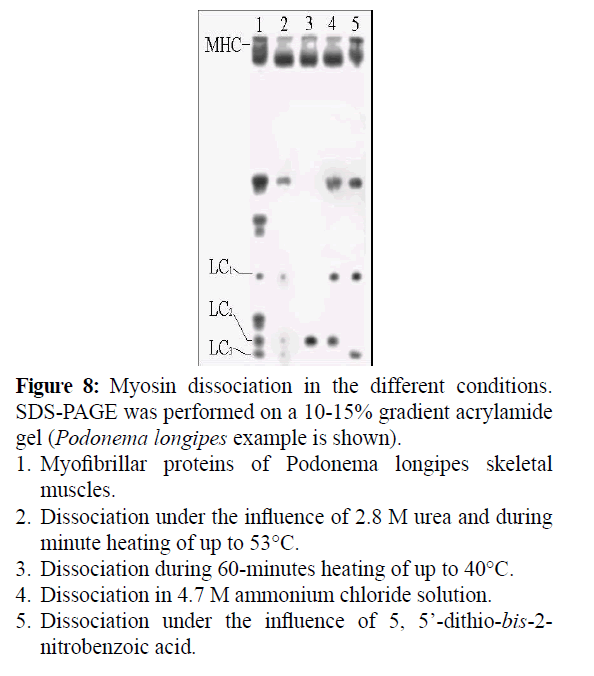 A partial light chain separation of myosin was carried out as demonstrated, in Table 4 conditions. Figure 8: Myosin dissociation in the different conditions. SDS-PAGE was performed on a 10-15% gradient acrylamide gel (Podonema longipes example is shown). 1. Myofibrillar proteins of Podonema longipes skeletal muscles. 2. Dissociation under the influence of 2.8 M urea and during minute heating of up to 53°ÃÂ¡. 3. Dissociation during 60-minutes heating of up to 40°ÃÂ¡. 4. Dissociation in 4.7 M ammonium chloride solution. 5. Dissociation under the influence of 5, 5’-dithio-bis-2-nitrobenzoic acid. Heat treatments at 40°C and lasting less than 60 min allowed us to selectively remove light chains LC1 and LC3 from myosin (Figure 8, Track 3). The light chain LC3 was removed from myosin by the prolonged incubation of the myosin in a concentrated ammonium chloride solution (4.5-4.7 M) (Figure 8, Track 4). The treatment of myosin with 5, 5’-dithio-bis-2- nitrobenzoic acid solution led to the removal of light chain LC2 only (Figure 8, Track 5). Actin of skeletal muscle tissues of deep-sea fish has been easily extracted by using low ionic strength solutions. However, most regulatory proteins have been extracted in this manner as well. So, the method, based on depolymerization of fibrillar actin and on higher thermostability of actin globular form, was used (Dominguez, R and Holmes, K.S., 2011). Extraction time was limited to 5 minutes. Because upon the increase of extraction time, the fair quantity that passed into extract impurity proteins exceeded actinin quantity by more than 5 times. The actin and actinin were separated by the means of fractional precipitation. The purity of the actin preparations was calculated, from the area of the band in the densitogram pattern for SDS-PAGE, to be 90-94%. Their yields were 54-70% based on the quantity in the muscle tissue. Tropomyosins of deep-sea skeletal muscles were isolated and purified by the Bailey method (Bailey, K., 1948). Tropomyosin is known to be a protein without tryptophane in its structure and its UV-spectrum looks like a spectrum of tyrosine (Staprans, I., Watanabe, S., 1970). Proteins with identical spectral characteristics were isolated by us, from deep-sea fishes myofibrils: UV-spectrum maximum 277.4-278.8 nm, and AU278 / AU260 ratio-1.98-2.03. However, different compositions of subunits were established (Tables 5 and 6). Only in the case of C. pectoralis tropomyosin the α:β ratio was normal according to the value which is known for an overwhelming majority of vertebrates (Shiraishi, F., 1993). skeletal muscles of C. cinereus, P. longipes and C. pectoralis are almost equal to each other (Table 6). Table 5: Myosin subunits ratio and molecular weights of myosins. Table 6: Composition of deep-sea fishes muscle tropomyosin. MW, MWα, MWβ – molecular weight of tropomyosin and α, β-tropomyosin subunits accordingly. Troponins of deep-sea fishes muscle tissue were differed in their subunits ratio too. In contrast to traditional objects (Shiraishi, F., 1993; Yates, L.D and Greaser, M.L., 1983; Perry, S.V., 1998) troponins of deep-sea fishes skeletal muscles aren’t equimolar The α:β ratio for C. cinereus and P. longipes tropomyosins was below typical values. Molecular weights of tropomyosins of complexes. Prevalence of the heaviest component was typical for all examined objects. The distribution of light components was different though, but, on the whole, molecular weights of troponins were close to each other (Table 7). Table 7: Molecular weight and quantitative composition of deepsea fishes’ muscle troponins. MW -Molecular weight. The non-equimolar composition of troponin was earlier known (Islam, A., 2006) to have been observed. The different rates of proteolytic degradation of troponin components are considered to be the reason for the non-equimolar composition of troponin. The processes of proteolysis of troponin components occurred both during isolation of proteins from muscle tissue and during freeze storage of intact muscle (Tanokura, M et al., 1983; Wei, B and Jin, J.P., 2011). In our case, the troponin components ratio was practically constant or slightly changed during either treatment or storage of muscle tissue. The isolation of all basic protein has allowed us to carry out precise references of signals of the electrophoretic pattern to the relevant proteins (Figure 9) and to calculate its abundance (Table 8). Figure 9: Densitograms of SDS-gel electrophoretic pattern of deep-sea fishes myofibrillar proteins: a) Coryphaenoides cinereus b) Podonema longipes c) Coryphaenoides pectoralis. Abbreviations: MHC-myosin heavy chain: Ac-Actin; Tn -Troponin; Tm -Tropomyosin; LC1-3-myosin light chain. Table 8: Quantitative composition of deep-sea fish myofibrillar proteins. MW -Molecular weight of protein or its subunits. MW–Molecular weight of protein or its subunits. These results indicated that the composition of proteins of skeletal muscle tissue of examined deep-sea fish species differs in contents of myosin, whereas other main myofibrillar proteins are contained in comparable quantities. Consequently, the different values in the myosin/actin ratio were observed. Arai, K., Kawamura, K., Hayashi, C. (1973) The relative thermo-stabilities of the actomyosin-ATPase from the dorsal muscles of various fish species. Bull Japan SocSci Fish 39, 1077-1085. Uchiyama, H., Katoh, N., Kudo, Y., Arai, K. (1978) Thermostability of Ca2+-activated myofibrillar ATPase of epipelagic and mesopelagic fish species. Bull Japan SocSci Fish 44, 491-497. Taguchi, T., Tanaka, M., Suzuki, K. (1981) On heat coagulation of water soluble proteins from deep sea fishes. Bull Japan SocSci Fish 47, 551-554. Dayton, P.K., Hessler, R.R. (1972) Role of biological disturbance in maintaining diversity in the deep sea. Deep-Sea Research 19, 199-208. Drazen, J.C., Buckley, T.W., Hoff, G.R. (2001) The feeding habits of slope dwelling macrourid fishes in the eastern North Pacific. Deep-Sea Research 48, 909-935. Wakai, N., Takemura, K., Morita, T., Kitao, A. (2014) Mechanism of deep-sea fish alpha-actin pressure tolerance investigated by molecular dynamics simulations. PLoS One 9, e85852. Morita, T. (2010) High-pressure adaptation of muscle proteins from deep-sea fishes, Coryphaenoidesyaquinae and C. armatus. Ann N Y AcadSci1189, 91-94. Somero, G.N. (1992) Biochemical ecology of deep-sea animals. Experientia48, 537-543. Siebenaller, J.F., Somero, G.N., Haedrich, R.L (1982) Biochemical characteristics of macrourid fishes differing in their depths of distribution. Biological Bulletin 163, 240-249. Kato, N., Uchiyama, H., Tsukamoto, S., Arai, K. (1977) A biochemical study on fish myofibrillar ATPase. Nippon Suisan Gakk43, 857-867. Kato, S., Konno, K. (1993) Isolation of carp Myosin rod and its structural stability. Nippon Suisan Gakk59, 539-44. Bruggmann, S., Jenny, E. (1975) The immunological specificity of myosins from cross-strained muscles as revealed by quantitative microcomplement fixation and enzyme inhibition by antisera. Biochem.Biophys412, 39. Bailey, K. (1948) Tropomyosin: a new asymmetric protein component of muscle fibril. Biochem J 43, 271-279. Ebashi, S., Kodama, A., Ebashi, F. (1968) Troponin. Preparation and physiological function. J Biochem64, 465-477. Ishikawa, H. (1983) Fine structure of skeletal muscle. Cell and muscle Motility. N.Y. Plenum Press 1-40. Weber, K., Osborn, M. (1969) The reliability of molecular weight determinations by dodecyl sulfate –polyacrylamide gel electrophoresis. J BiolChem224, 4406-4412. Turoverov, K.K., Kuznetsova, I.M., Uversky, V.N (2002) Capture of intermediates in protein unfolding-refolding reactions by fluorescence diagram method. Recent Res DevelBiophys1, 101-119. Turoverov, K.K., Biktashev, A.G., Khaitlina, S.Yu.,Kuznetsova, I.M. (1999) The structure and dynamics of partially-folded actin. Biochemistry 38, 6261-6269. Lowry, O.H., Rosebroughm N.J. (1951) Protein measurement with the Folin phenol reagent J BiolChem193, 265-275. Seki, N., Narita, N. (1980) Changes in ATPase activities and other properties of carp myofibrillar proteins during ice-storage. Nippon Suisan Gakk46, 207-213. Okagaki, T., Takami, M., Hosokawa, K., Yano, M., Higashi-Fujime, S. et al. (2005) Biochemical properties of ordinary and dark muscle myosin from carp skeletal muscle. J Biochem138, 255-262. 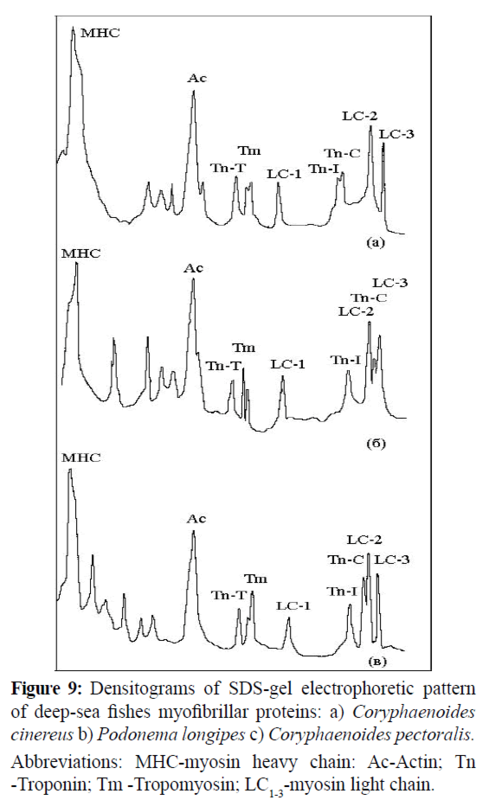 Mori, Y., Horie, N., Tsuchiya, T., Matsumoto, J.J. (1980) Characterization of adenosinetriphosphatase of squid actomyosin. Bull Japan SocSci Fish 46, 1533-1537. Weber, H.H., Portzehl, H. (1952) Muscle contraction and fibrous muscle proteins. AdvProtChem7, 161-236. Maruyama, K., Gergely, J. (1962) Interaction of actomyosin with adenosine triphosphate at low ionic strength. I. Dissociation of actomyosin during the clear phase. J BiolChem237, 1095-1099. Dominguez, R., Holmes, K.S. (2011) Actin structure and function. Annu Rev Biophys40, 169-186. Staprans, I., Watanabe, S. (1970) Optical properties of troponin, tropomyosin and relaxing protein of rabbit skeletal muscle. J BiolChem245, 5962-5966. Shiraishi, F. (1993) Preparation of three troponin components from puffer skeletal muscle. Fukuoka IgakuZasshi84, 339-344. Yates, L.D., Greaser, M.L. (1983) Troponin subunit sticheometry and content in rabbit skeletal muscle and myofibrils. J BiolChem258, 5770-5774. Perry, S.V. (1998) Troponin T: genetics, properties and function. J Muscle Res Cell Motil19, 575-602. Tanokura, M., Tawada, Y., Ono, A., Ohtsuki, I. (1983) Chymotrypticsubfragments of troponin T from rabbit skeletal muscle. Interaction with tropomyosin, troponin I and troponin C. J Biochem93, 331-337. Wei, B., Jin, J.P. (2011) Troponin T isoforms and posttranscriptional modifications: evolution, regulation and function. Arch BiochemBiophys505,144-154.